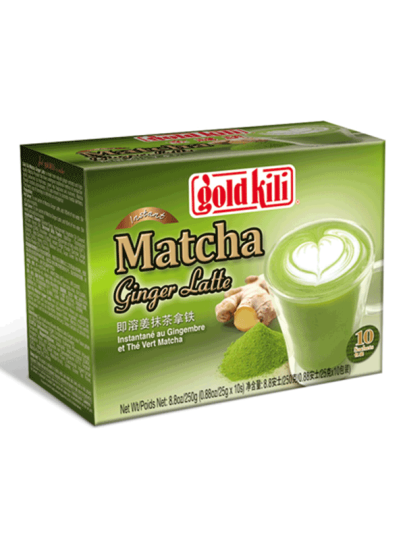 Gold Kili Matcha tea with ginger is made using natural ginger extracts and with high quality Matcha powder that have passed the traditional way of production that preserves freshness. Green tea with a specific smell and full of nutrients. Matcha powder contains antioxidants. It is also known to stimulate vigilance. Hot Tea: In a bag of Match Ginger Latte, add 180 ml of warm water. Stir and serve immediately. Cool Tea: Add 90ml of warm water to a bag. Mix evenly and then add ice and serve. creamy base (glucose syrup, hydrogenated vegetable oil (coconut oil, palm kernel oil), skim milk powder, stabilizer: E340ii, emulsifier E471, color: E160a, instant powder of ginger (sucrose, ginger extract (0.6%), %), malt syrup), sugar, green powdered tea, matcha powder (2%), aroma.